Complete with comments about each lighthouse. Boon Island is a hellish strip of jagged rocks waiting to rip open a passing ship. It's an impossibly inhospitable place that witnessed a cannibalism incident in 1710 when the Nottinham Galley ran aground, and the survivors had no way to get to shore. Boon Island is 9 miles offshore from York Beach. One of our most frequently visited pages. The rugged, deeply indented coast of Maine has more than 60 lighthouses. A page devoted to lighthouse facts like: "The tallest lighthouse is at Cape Hatteras, N.C. and stands 196 feet tall. Floating lighthouses are called Lightships which were essential partners with America's lighthouses as part of the federal government's commitment to safe navigation on the nation's coasts and on the Great Lakes. Do you know the MLS number of the property you're looking for? Here's a place where you can easily search for any listings with a specific MLS number. Or if you know the name of the town you can search for Maine real estate listings by town name. Between 1820 and 1983, the U.S. government established 116 lightship stations on three coasts and on the Great Lakes. Among the more famous and significant lightship stations were "Ambrose," marking the southern entrance into New York harbor along the New Jersey coast; "Nantucket," marking not only the entrance to Boston harbor but also the American end of the transatlantic route; "Chesapeake," marking the entrance into Chesapeake Bay, "Diamond Shoals" off the Outer Banks of North Carolina, which marked a dangerous spot along the coastal ocean highway by way of the Gulf Stream; and "San Francisco" on the bar three miles out from the Golden Gate. These were among the better known stations; others, less known to the public, were as important if not more significant, such as the Huron station on Lake Huron, which safely guided a major proportion of the nation's maritime traffic across the Great Lakes. Find your way to all the lighthouses that dot the coast of Maine. Visiting and photographing lighthouses are popular hobbies as is collecting ceramic replicas. In some locations, lighthouses have become popular travel destinations in themselves and the buildings are maintained as tourist attractions. In the US, National Lighthouse and Lightship Weekend is celebrated on the first weekend of August, and International Lighthouse and Lightship Weekend is celebrated on the third weekend. Many lighthouses are open to the public and amateur radio operators often communicate between them on these days. The American Lighthouse Foundation's (ALF) short-term goals are to prevent the further loss and deterioration to historic lighthouses under the direct control of the organization and to garner public and private sector support to effectively sustain and grow such lighthouse preservation measures. In addition, ALF is seeking to enhance the educational and cultural value associated with the Museum of Lighthouse History and striving to integrate �Kids on the Beam� � a unique learning initiative centered on our nation�s lighthouse history, within student curriculum and throughout the lighthouse community�s youth members. Representatives from the Maine Lobster Festival presented a check for $20,000 to the Maine Lighthouse Museum Friday morning. The donation is part of the festival�s continued pledge of support to the museum, said Pete Cella, president of the Maine Lobster Festival. The money will go toward the museum�s operating costs, according to the museum�s director, Bob Trapani. �The Maine Lighthouse Museum is extremely grateful for the ongoing support of the Maine Lobster Festival, which proves to be a huge difference-maker in the museum's mission to exhibit and conserve the nation's largest collection of classical Fresnel lenses and lighthouse artifacts. Thanks to the Maine Lobster Festival's care and generosity, together we are 'shining a bright light' on our lighthouse heritage for present and future generations,� Trapani said. Lighthouse Point is for sale. Lighthouse Point is a unique oceanfront home with a stunning location & dramatic design. Known as Lighthouse Point for its distinctive lighthouse feature, the residence was designed and built with attention to detail and many amenities. The unusual lighthouse tower, with its 360 degree views of the ocean, spruce clad islands and Camden Hills beyond, is truly unique. Call us at 800-293-4416 for additional details or to arrange a showing. With Maine's vastness it will help to have a trustworthy Maine buyer broker on your side to facilitate the process. One agent who will be your scout, guide, and intermediary wherever your search may lead. 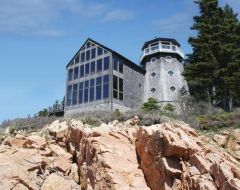 If there is a lighthouse for sale on the coast of Maine then it's our job to help you find it. We'll also help you negotiate your way to owning it. As you no doubt already know, the real estate buying process is becoming increasingly complex, with rapid changes and varying conditions in local markets. Our job, as experienced coastal Maine real estate professionals, is to offer local CoastWise knowledge. We know how the land, culture, and amenities of different areas vary, and we understand that your search for Maine coast property may cover a thousand miles of shoreline and many seasons. We are patient and resourceful. We're also skilled negotiators, trained and ready to protect and advance your interests at every stage of the process.